Kris grew up on the Eastern Shore of Maryland and moved to the D.C. area in 1996. Since that time, he has developed expert knowledge of the region and its many diverse and historically-rich residential neighborhoods and commercial districts. He developed a passion for architecture and real estate while interning at an architectural firm and drawing historic D.C. buildings in college coursework. This passion grew stronger after purchasing and renovating his first home in D.C.’s Eckington neighborhood and watching the community and the city continue to grow and evolve. Kris brings strong business acumen, dedication, and attention to detail to his career as a real estate agent. 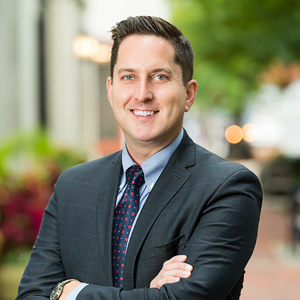 His years of public sector experience at the Library of Congress coupled with his MBA from the University of Maryland have provided him with strong skills in negotiation, marketing, business strategy, finance and the development of client-centric partnerships. Kris is recognized as a top producing agent by Washingtonian Magazine. After spending several years at a smaller real estate firm, Kris joined the Erich Cabe Team at Compass. He believes Compass has the tools and network available to provide maximum benefit for his clients. The purchase or sale of a home can be one of the most significant financial decisions a client makes and Kris uses his skills and personable demeanor to make this process as seamless as possible. When Kris isn’t at work helping his clients find their perfect home, he enjoys cooking and entertaining with friends, home improvement projects, gardening, playing his saxophone in local community groups and spending time with his partner Dennis and dogs Ellie and Winston in their 1925 Sears Kit House in D.C.’s Shepherd Park neighborhood.